According to a report from 2017, almost 6% of Americans identify themselves as vegetarians. Only 1% of the population described themselves as vegetarians in 1971. Mismanaging your protein. Folks new to vegetarianism don’t properly combine foods to provide sufficient amounts of complete protein for their age and activity level. Many people wind up relying on protein shakes, which is not the ideal way to obtain protein. Most of your protein should come from whole, real, fresh foods. A holistic health practitioner can help you establish good, flavorful meal planning strategies. To track your nutritional intake, try this awesome program: cronometer.com. It has both free and paid account options. 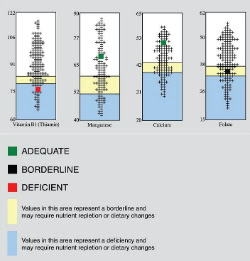 To understand your nutrient needs and assess risk for deficiency, see a holistic health physician for a nutrient assessment test (details below). This simple blood test indicates if deficiencies are present and need to be corrected, as well as how to best support already good health with the right dose and type of supplements for you. On your next foray down the produce aisle, don’t overlook the wonderful sunchoke, aka Jerusalem Artichoke. These tubers look nothing like an artichoke and are easily mistaken for a strange potato!. A native North American plant, sunchokes are a member of the sunflower family. Simplicity can be the spice of life and this recipe offers both. Sunchokes have a delightful flavor that is enhanced in this recipe with fresh minced garlic, parsley and Olive Oil. Roasting makes sunchokes (Jerusalem Artichokes) tender on the inside and lightly crisp on the outside. This dish is a perfect addition to any evening meal or for a tasty, healthy snack. Scrub sunchokes with a vegetable brush. Cut tubers into 1-inch bite-sized pieces. In a medium-size bowl, toss sunchokes with olive oil, garlic, salt, and pepper. Arrange sunchokes in a single layer on a baking sheet. Roast in the preheated oven for 20-25 minutes, turning once, until the sunchokes are golden brown. Vegetarianism has many health advantages, but a poorly designed diet poses significant health risks. Research shows that vegetarians (and vegans) are vulnerable to deficiencies in two important B vitamins: B12 (cobalamin) and B6 (pyridoxine). If ever a group of vitamins could be considered “the Force” within you, it’s the B-Complex group, which synergistically supports energy production. Individually, each B vitamin – B1 (thiamin), B2(riboflavin), (niacin B3), B5 (pantothenic acid), B6, B12, biotin, and folate are vital to different physiological processes throughout the body. Specifically, B12 is essential for healthy nerve cell communication while B6 is necessary for hormone regulation and breaking down dietary fat, protein, and carbohydrates. It’s difficult to obtain sufficient, high-quality amounts of food-based B6 and B12 when meat, fish, eggs, and dairy are eliminated. B12 is not present in plants, so vegetarians usually need to take a supplement. Some plants contain a “glycosolated form” of B6 that is not absorbed easily or used efficiently in the body. The aging process, a vegan diet, stress, certain medications, and illness also can alter your body’s ability to utilize vitamins taken from food. Signs of B12 deficiency include extreme fatigue, sadness, irritability, loss of appetite, anemia, lower immunity, and increased risk for heart disease. B6 deficiency is associated with PMS, depression, and insomnia; it can lead to nerve damage in the hands and feet, which is usually reversible with proper supplementation. A holistic health practitioner can order a blood test to determine if a vitamin deficiency exists and work with you to identify the appropriate supplement (vitamins, injection or nasal gel, or sublingual tablet), form of that supplement and dietary improvements for your health needs. What makes a sprout so good for you? Sprouting is the moment of greatest vitality in a plant’s life cycle, the phase in which the seed activates and makes its way through the topsoil and sprouts into the fresh air above. At this high point of metabolic and enzymatic changes, the sprout contains high levels of nutrients. And that’s what makes sprouts good for you, particularly Alfalfa. Alfalfa (Medicago sativa) is a legume that is also considered to be an herb. The leaves and seeds can be used fresh, or dried for supplements, and the sprouts are enjoyed with meals. It’s high in Vitamins A, C, and K and contains several B vitamins. A good source of dietary fiber, copper, magnesium, and iron, Alfalfa contains active plant compounds currently being evaluated for benefits in women’s health, managing high cholesterol, and effects on the nervous and cardiovascular systems. When selecting sprouts, look for those that have been kept chilled in the produce section and choose organic when possible. The International Sprout Growers Association (ISGA) seal on a product indicates the sprouts have been carefully grown and handled. Look for clean roots with a creamy white color. Buds should be attached to the stem. Sprouts should be odorless. Keep sprouts refrigerated and use within 2 days of the sell-by date on the package. Enjoy sprouts atop salads, sandwiches, or as a garnish for prepared entrees. And that’s why a Nutrient Assessment is important. In holistic medicine, specialized tests are available to assess nutrient status. These tests are also known as Functional Nutrient Assessment, Nutrient Status Testing, or Micronutrient Testing. Using samples of blood, stool, urine, or hair, these tests evaluate how well your body absorbs and utilizes each nutrient assessed, along with the amount and functional availability of vitamins, mineral, and antioxidants in your cells. They help identify the nutritional supplements needed to achieve and maintain good health and lower your risk for serious illness. Ask your holistic health practitioner about the type of nutrient testing that is most appropriate for you.